Elliott/Pasek/Paul; Lewis/Pasek/Paul; Pasek/Paul. Fine. In fine packaging. The Greatest Showman-The Greatest Showman: Reimagined by The Greatest Showman. Elliott/Pasek/Paul; Lewis/Pasek/Paul; Pasek/Paul. Very Good. In very good packaging. 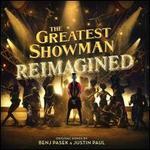 The Greatest Showman-The Greatest Showman: Reimagined by The Greatest Showman.